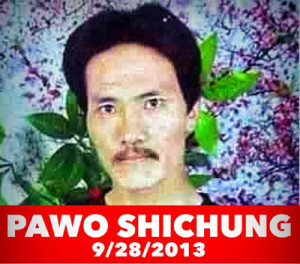 Pawo Shichung lit himself of fire and died today, Sept. 28th. He was 41 years old, married, and the father of two teenage daughters. Schichung attended a prayer function, went home, lit some butter lamps in front of a portrait of the Dalai Lama (this constitutes a crime in China) and then set himself on fire. He walked onto the road, to make the motives of his protest clear. His body was rescued by Tibetans, but then forcibly taken away by the Chinese police. Had the Tibetans tried to keep the body to give his family, they would have been arrested. Schichung lived in the Ngaba Tibetan Autonomous Prefecture in Sichuan. The region is part of the Tibetan cultural and historical region of Amdo and it’s where many of the Tibetan self-immolations have taken place. With this, Schichung becomes the 128th Tibetan known to self-immolate calling for Tibetan freedom and for the return to Tibet of the Dalai Lama. Self-immolation as a form of protest has a long history in Buddhist culture. On September 13th, Cao Shunli was about to board a flight to Geneva to testify about human rights violations in China, when she was questioned and barred from taking the flight. She has not been heard of since, and she’s thus suspected of being the victim of a “forced disappearance” by the Chinese government. As you read this, she is likely to be enduring torture and/or cruel, degrading and inhuman treatment. It won’t be the first time. After participating in a street protest in 2009, Cao Shunli was arrested without charges, tortured during a week in a police station and then sent to a “re-education camp” for another year of mistreatment. She was never allowed to see a lawyer. In re-education camps, prisoners must spend the whole say – save for meal breaks – sitting down, with their backs straight and arms next to their sides, listening to lectures on how to be proper Chinese citizens. At night, they have to work for free. They are not even allowed a break when they sleep, they are forced to do so straight, on their backs, with their mouths facing upwards (like corpses). Their only hope of being freed is being convincing enough in their “confessions” to convince the authorities that they have been rehabilitated into mindless, servile citizens. Please e-mail the Chinese Embassy in Washington (chinaembassy_us@fmprc.gov.cn) to ask for her freedom. 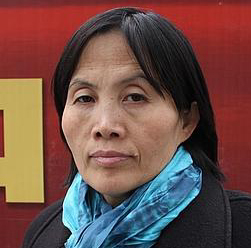 Free Anti-Corruption Campaigner Liu Ping! Liu Ping, an anti-corruption activist in Xinyu, Jiangxi Province, has been imprisoned since May of this year. She is a former independent candidates for the People’s Congress in Xinyu. She was arrested on May 9, 2013 for calling for public disclosure of officials’ assets as well as for the release of the rights defenders who had been previously detained on similar grounds. She has been indicted with two other activists on charges of “inciting subversion of state power,” “gathering a crowd to disrupt order in a public place” and “using a cult to damage enforcement of the law”. She is is currently being held at the Xinyu Municipal Detention Center. 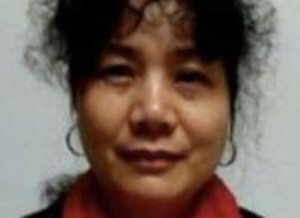 Please e-mail the Chinese Embassy in Washington (chinaembassy_us@fmprc.gov.cn) to ask for her freedom. 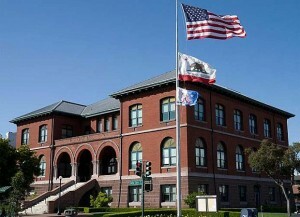 Make sure to mention that you heard about her case because of San Leandro Councilmember Benny Lee.